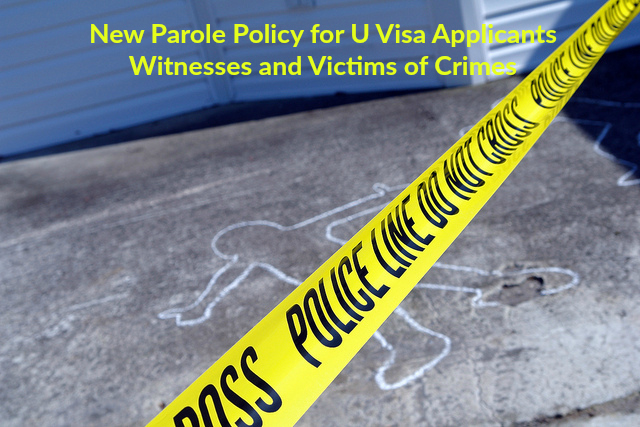 In the absence of a clear uniform U visa parole policy, the Ombudsman’s office called on DHS and USCIS to implement a parole policy to allow eligible U visa petitioners and their family members residing abroad, the opportunity to enter the United States, and await availability of their U visas within the United States instead of waiting for availability of a U visa from abroad. The U.S. Department of Homeland Security responded recognizing that the cooperation of U visa applicants in ongoing investigations is of significant importance to the United States for the effective prosecution of crimes. Understandably, key witnesses and victims of crimes cannot effectively aid law enforcement and government officials from abroad. The United States thus has a clear interest in expediting their travel to the United States, in exchange for their cooperation and the benefits that cooperation would provide to law enforcements officials and the public at large. In a separate memorandum, USCIS announced that they have taken the Ombudsman’s recommendations into consideration and will implement the new parole policy in Fiscal Year 2017. USCIS will create a new stand-alone application form for parole requests and will prepare policy guidance to be released some time in Fiscal Year 2017. USCIS will also be releasing a response to additional recommendations suggested by the Ombudsman’s office including 1. That the parole policy should allow concurrent filings of the U visa petitions and requests for parole and 2. That cases should be adjudicated at the Vermont Service Center (VSC), where U petitions are currently being processed to ensure efficient adjudication of parole requests. We will notify our readers as soon as these recommendations have been considered. For more information on the U nonimmigrant visa please visit our website.